I ate an $8 grilled cheese sandwich at Atlantic No. 5. Was it worth it? The inside of Atlantic No. 5 on Main Street. Cold weather and a long line outside of The Main Eatery prompted my first visit to Atlantic No. 5, a new restaurant on Main Street in downtown Louisville. 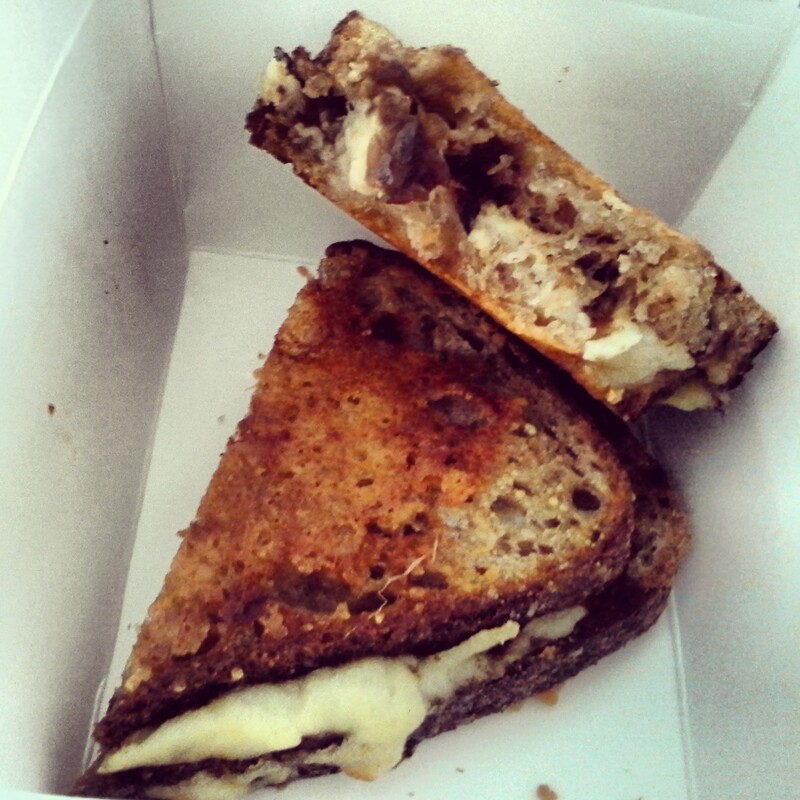 Last Friday, I had my heart set on a tomato soup and grilled cheese sandwich from The Main Eatery. It was the first cold Friday of the fall, so the line for other seekers of that legendary soup-and-sandwich combo was out the door and to the corner of the block. It was 12:15. I didn’t have time for that. Atlantic No. 5 was just a few doors down. 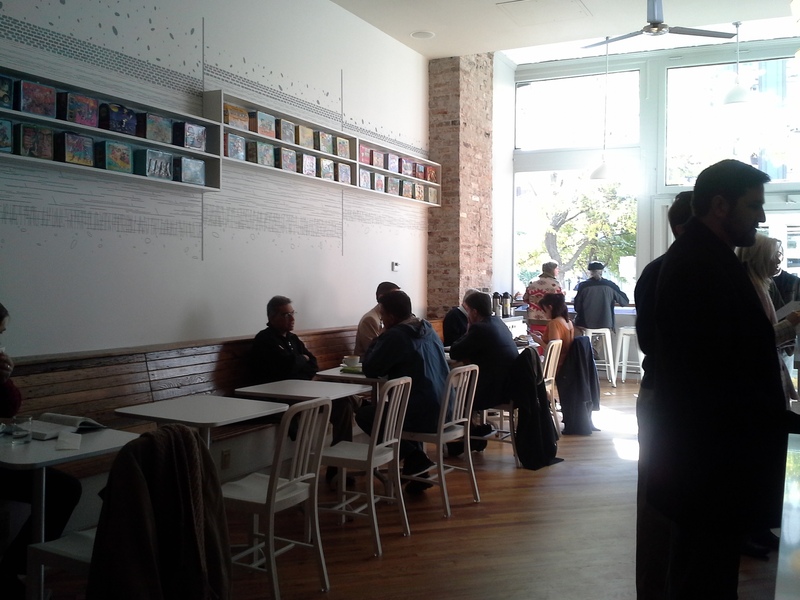 I glanced inside and saw that the line was contained to the warm interior of the bistro. Customers hovered over cups of soup as they skimmed newspapers. A server walked around the counter with something that could pass for a grilled cheese. That was enough for me to give this restaurant a try. Located at 605 W. Main Street, the new restaurant will be “very bistro like,” according to Michael Trager-Kusman, who said he and his partners sought to create a relaxed concept. “We want it to be a place you come and go, stop and have a snack, a light dinner, a beer or a glass of wine,” said Trager-Kusman, who’s also seeking a full liquor license. The dishes offer fresh takes on traditional Southern ingredients by pairing regional favorites with Eastern-inspired additions, such as a golden beet and couscous salad or the marble potato salad with turmeric-pickled cipollini. The rotisserie pork and beef meatball sandwiches also get a creative splash with the addition of broccoli rabe and carrot-cumin tomato sauce, respectively. But is this a place where I can get a great soup and grilled cheese? The menu items at Atlantic No. 5 are a la carte, which is French for, “We don’t do value meals here.” Sandwiches are $6 to $9, and a cup of soup (rustic tomato or coconut squash) is $5. I wasn’t on a $10 Challenge, but my bank account wasn’t in the mood for a $14 lunch. So I compromised with a grilled cheese sandwich ($8) and a bag of potato chips ($1.50). A grilled cheese sandwich, all snug in a nice to-go box. The sandwich was made up of white cheddar, fontina and goat cheeses on country French bread with a balsamic-onion marmalade. Three creamy cheeses on one sandwich are good; a tart onion spread to cut some of the richness is even better. What the small sandwich lacked in size, it made up for in decadent ingredients. The sandwich, and I imagine the rest of Atlantic No. 5’s menu, is something that I would order when it’s time to treat myself to a little bit of fancy to break up a work day. The price and size of the meal, however, will keep me from making this new downtown restaurant a regular lunchtime stop. Good to know! This is right across from my office. I rarely eat lunch out because of the cost – but, this might be a good place for lunch meetings. It would be a good place for a business lunch — it’s a nice atmosphere.